It’s been a while since we’ve included some sprinkles in our lineup here. 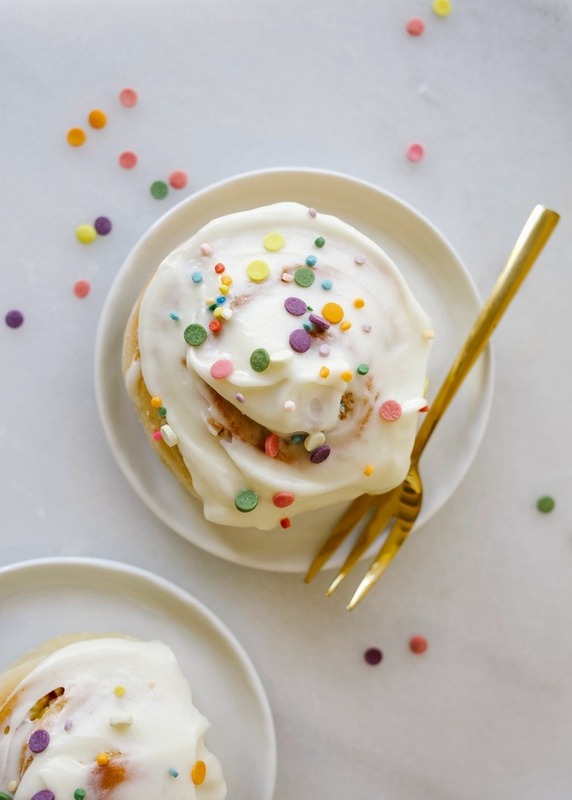 The sprinkles, birthday cake flavor, and bright colors that make up these funfetti rolls make me feel like we’re celebrating, and you guys know how much I love a party. Our mornings deserve something extra-special, extra-festive, extra-fun, don’t you think? 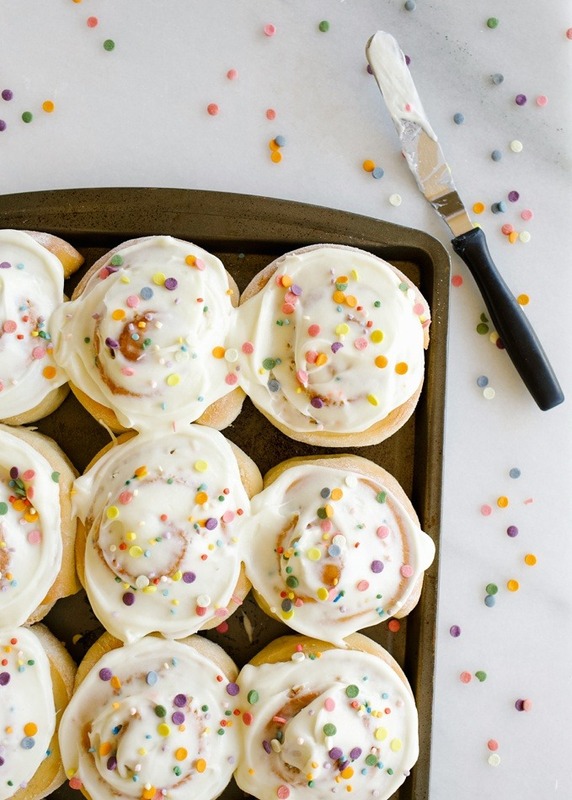 If you ask me, these funfetti rolls are just the ticket. With all of the breakfast recipes we’ve been sporting on this site this month, mornings have been seriously special in my house lately. The other morning I prepared my kids what is, to use, a normal healthy breakfast and they were appalled. Like, where’s the cinnamon rolls, Mom? Where’s the chocolate bread and pound cake and muffins? WHERE IS THE SUGAR IN THIS BREAKFAST? Clearly I need to send the little sugar junkies to breakfast bootcamp for a little reset. These funfetti rolls really do not help the cause. Aimee caught a glimpse of a test round of these buns on the counter and literally lost all chill. Within 3 minutes she had dragged a stool over to the counter, climbed onto the marble, and was nibbling on sprinkles from the sticky tops of these treats. The look on her face was equal parts guilt and delight, because, let’s be honest- there’s not a kid (read: human) in the world that doesn’t get a little bit excited by the site of sprinkles. They’re so special that I really couldn’t blame her. 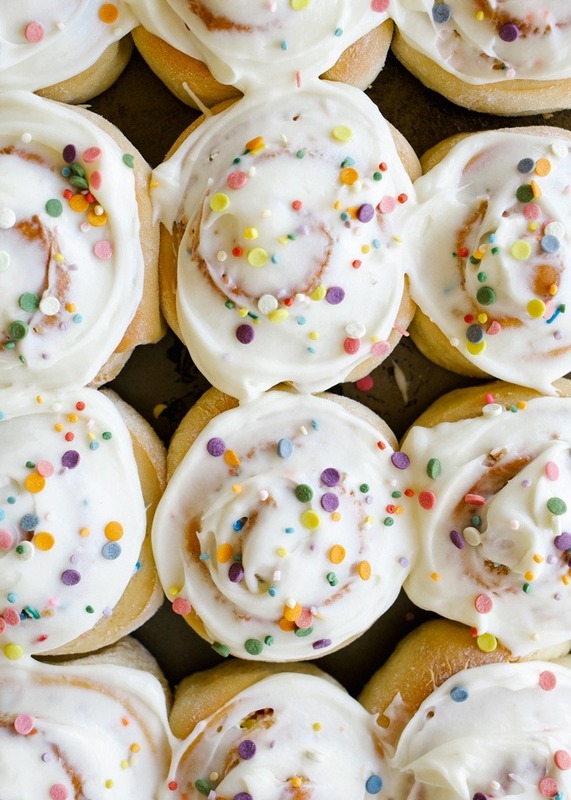 So these funfetti rolls are maybe the most fun you can have in your morning. Yes, they take time to prepare, and , yes, there’s several steps involved. But are they worth it? Yes. 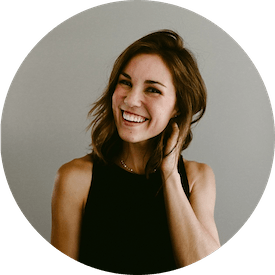 Will they make your kids/roommate/BFF feel like the most special kid on the block? For sure. And do they taste ridiculously close to the funfetti box cake mix you grew up loving? Yep. If you’re tracking with me let’s chat the ins and outs of these rolls. You’re going to love them. 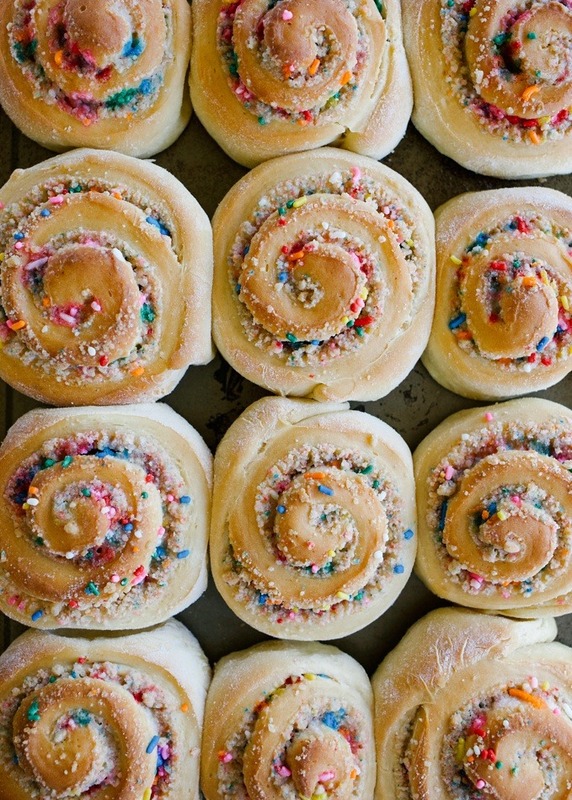 To make these funfetti rolls we start with the dough. I adapted my overnight cinnamon roll dough to work for this recipe. It’s the same fluffy, lightly sweetened yeast dough that I’ve grown to love, and while it does take some time to rise and roll, you can certainly follow the instructions from that original recipe to space out the work overnight. While we wait for the dough to proof we can go ahead and prepare the birthday cake crumb filling. You might remember these crumbs from the funfetti ice cream cake I made a while back, but these little beauties are the same recipe that Christina Tosi made famous at NYC’s Milk Bar. With little more than cake flour, sprinkles, and sugar, we whip up a wet, crumbly dough that bakes into crispy, cake mix-favored crumbles. The essential ingredient here is the clear vanilla extract. Regular vanilla simply will not do if you want to recreate that box cake flavor. You can find the extract at your grocery store, craft stores, or online here. Follow the instructions to create the little crumbles, allow them to cool, and then whiz them in a blender or food processor to grind them to a coarse sand consistency. If you’d like to shorten the day-of baking process, feel free to make and freeze these crumbs in advance. When your dough is ready to roll, use a lightly floured surface and rolling pin to flatten out a large rectangle of dough. Spread your melted butter all over the dough to serve as the glue for your birthday cake crumbs, sugar, and sprinkles. Roll the dough into a long log and slice 1-1/4-1-1/2″ segments to turn out into your pan. For softer, gooier rolls, you can snuggle them into the pan closely, but if you’re looking for those perfect spirals, space them out about 2″ apart in your baking dish. Bake until the tops are barely bronzed and the internal temp reads 180 degrees. 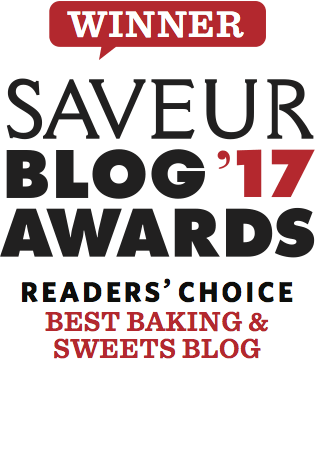 Do not overbake! Underbaked cinnamon rolls taste way better than dried out overbaked ones, so if you have a thermometer, now is the time to use it! 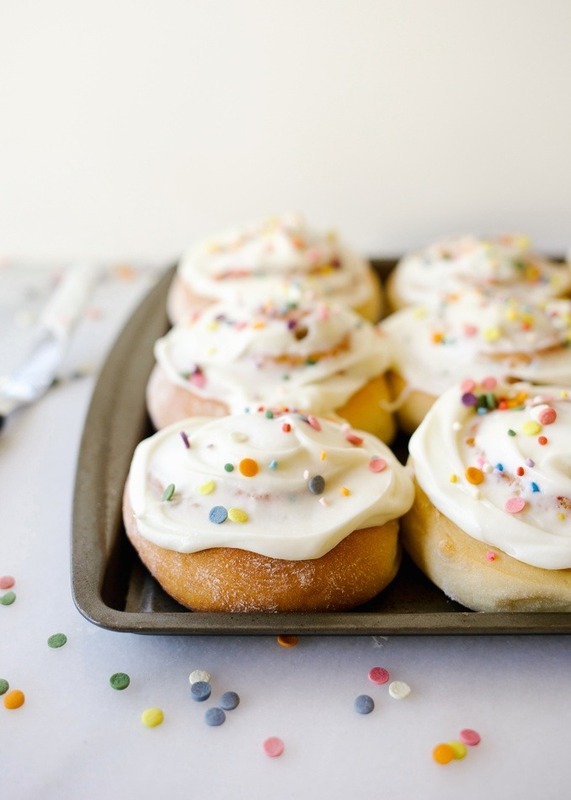 These funfetti rolls finish nicely with a sweet cream cheese frosting and a dusting of sprinkles. You can use your extra birthday cake crumbs as a garnish as well, but if you’re anything like me those little guys will already have long been consumed. 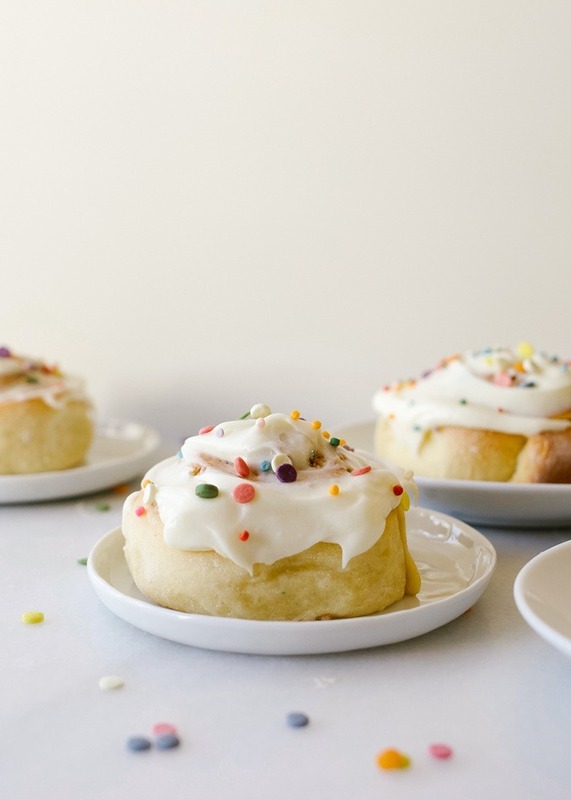 These breakfast treats put the FUN in FUNfetti and are worth every ounce of the effort they require. Give them a try and let me know what you think! Happy baking, y’all! Where did you get these sprinkles?? I have been searching for some like this and haven’t found look a likes in any grocery stores near me! oh gosh, i think they’re from india tree? but I just looked on their website and didn’t see. check out their selection on amazon though bc they have lots of natural colored sprinkles that are beautiful! Amazing! It sounds perfect for birthday parties! And taste so WOW too!